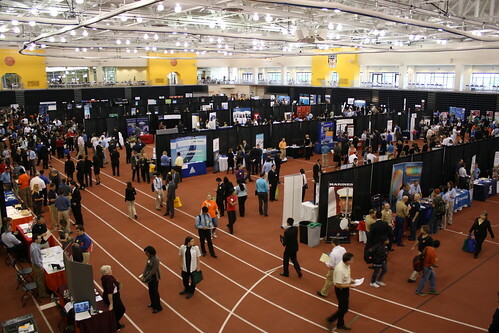 Last week I spent a few days on-campus at RIT for the Fall 2010 Career Fair. About a month ago I proposed to my corporate management that my company send me and a technical recruiter to the career fair. Having attended the event as a student I knew how many of our customers and competitors were there, so it seemed like we ought to be there too. I planned on driving up and found a place to stay, so the cost wasn’t going to be a big deal. They agreed. For starters, I’m not a recruiter. Outside of my own domain, I don’t have a lot of general knowledge about the kind of technical people we’re looking for. There are many aspects of the company’s business that I know nothing about, the result of the company doing lots of different things in many different markets. It’s hard to talk about environmental or engineering positions when you’re a software developer. I’m not in HR, either. As much as I’d like to hire every enthusiastic and qualified person that I talk to (whether they’re a student from my Alma mater or whether they’re a friend), I have almost no say whether a candidate is hired or not. Some companies were there specifically to grab a group of co-op students to fill recurring internship spots. While my division (and company as a whole) always has plenty of openings, I don’t think we had the intention of filling any of them specifically. We’re not very well known outside certain markets, but we still need to enable organic growth. How can a student consider us when they’re looking for jobs if they don’t know we exist? I think it was a great venue to drum up interest in the company, to make students aware that we are out there. I like to follow through with my commitments. As a result, I don’t make a lot of promises to candidates. When a student asks if there’s a job out there for them, I’m at a loss for words. There are probably jobs for which they are qualified, but there’s no guarantee of placement. I don’t want anyone hanging their hopes on me but at the same time I don’t want resumes to end up in a file folder somewhere. I told the students that I’d personally contact the hiring manager and recruiter if they applied to any specific openings. I think a personal hand-off is important. So far, a half-dozen kids have replied to me with job codes to look into. And so far, the coworkers I’ve contacted have been very receptive. Representing the company was a learning experience. I was impressed with the professionalism of the students I spoke to. No one seemed nervous. All were prepared with resumes and questions; some even brought along specific job postings. When I was looking for work, I don’t remember having it that together. The students I talked to had a lot of good questions, but the content of our conversations surprised me. No one asked about money, benefits, or stock. Some asked about how contracting works and how it was different from government service. Some asked about the process of obtaining a security clearance. Many asked how long I had been with the company and whether I was happy. A lot of students wanted to know what I specifically did for a living. That surprised me, since it’s unlikely that my career path will mirror theirs. I answered to the best of my ability. I sincerely hope that we’re able to place some of these kids. If it goes well, I hope we’ll return in the spring.